Formerly the Crazy Water Hotel, the building here is now a retirement and assisted-living community. 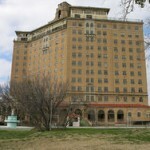 The hotel was built in the 1920s over the site of a well, and legend has it that the hotel’s name comes from the tale of a mentally unstable woman who went there every day to drink the water until she was cured. Witnesses have spotted a young girl’s apparition in the basement and a male ghost in the kitchen area.